All “legalese” should be agreed to and documents finalized between both parties. In other words, both sides review the agreements for accuracy. Once the final documents are agreed to, pick a point-person to become the keeper of the final versions and supervise the logistics of the collection of signatures on the final documents. The agreements refer to a lot of exhibits and schedules that aren’t yet complete. That’s what will be worked on this week. Some exhibits won’t be completed until the day before Closing. However, where possible, exhibits and schedules should be updated and finalized this week for the ones that won’t change before Closing. Exhibits and schedules sound fancy but these are just lists made in Word documents with generally little to no special formatting. Exhibits can also just be PDF versions of financial documents and asset lists downloaded from QuickBooks or other accounting software. The important thing about exhibits and schedules is that they be correct. The information represented becomes the legal record and the standard of judgment later, so all info should be double-checked on both sides for accuracy. Have someone prepare a detailed list of exhibits and schedules that can be used for everyone’s convenience. Checking the boxes on that list piece by piece is just fine, you don’t have to send in everything at once. The closing statement is a list of who gets what, and how the purchase price will be allocated. This is the same as when you buy a house, so it will have a multi-column review of cash proceeds contributed by the buyer and then disbursed to the seller net of fees. Send all exhibits to your designated point-person. He/she will verify that the exhibits received are satisfactory to be integrated into the final documents for signing at Closing. Multiple conference calls may happen this week to review the “punch list” of exhibits and other topics of interest. There will likely be an update status conference call two days before Closing to confirm any outstanding needs prior to Closing. The buyer team may arrive the day before Closing to perform a final walk-through on the equipment and inventory count. Final inventory will be taken on the evening before Closing. You will need to coordinate with the buyer to grant access and give assistance as needed. The final inventory count will become a schedule to be updated and included on the morning of Closing. If the business is being relocated, equipment will be shut down the day before Closing in preparation for loading and moving the days following Closing. 9am: You will print off all the documents and review them one last time, usually with the attorney in the room to confirm that these are in fact the “final final” versions as agreed to. Then sign them all in the appropriate spots. The buyer will do the same. 10am: Once the documents are signed, you and the buyer scan all the documents and send them to each other. It is advised that counsel(s) is CC’d on the email so that they too retain a record of the real-time exchange of these signed documents. Yes, it is totally legal and OK to have digital copies of these documents, signed separately, act as the final binding contract. Sometimes each party will sign two sets of originals and then send a paper copy to the other so that the final paper closing binder will have original ink signatures together as well. This is up to you and your attorneys. 11am: Both parties review the signed documents of the other. Final confirmation of the correct and complete execution of documents is confirmed. 12pm: Wiring authorization confirmed by the buyer, so the bank can now wire funds to your account per previously delivered instructions. 1pm: After some amount of hand-wringing and pacing the office, the call comes in from your bank that the wire has been received. Some variation of relief occurs, often followed by plans for a nap. No witnesses are needed. You can sign anywhere you like: your office, your attorney’s office, bank branch, Kinko’s… Just have a scanner close by. This may seem simplistic but this is the process we see almost all of our other deals follow. 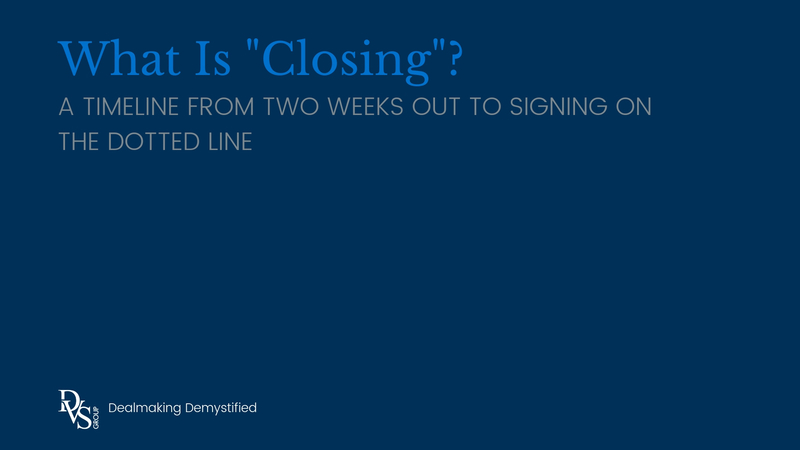 It’s relatively rare for everyone to be in the same room for Closing. Closing a deal is tough but it doesn’t compare with the work it will be to shift from “business owner” to whatever is next. The real work is about to begin.